Read this post in a good format on Swift Post. I’ve shared my first experiences about backend development in Swift in my previous blog post. This is the follow-up post. 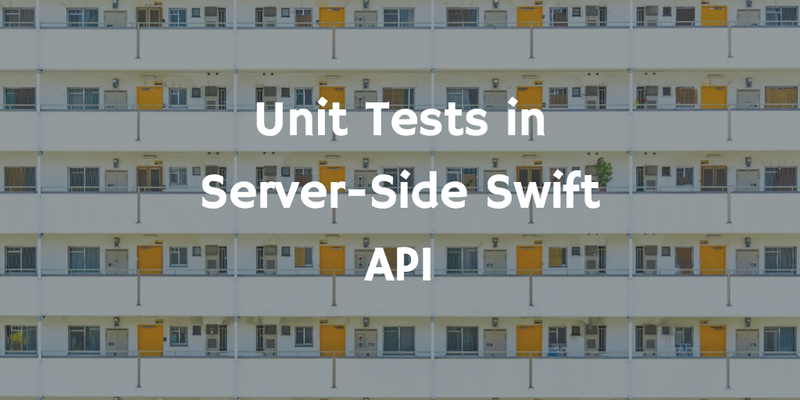 I’ll talk about Unit Tests in Swift. Swift accepts only one executable file for the app. We need to split app and library to make it testable. Because testing requires the separate executable file. main.swift file is the main executable for app. LinuxMain.swift file is the main executable for tests. To split them, we’ll create two targets. One target is the library which will consist of all our code. The other one is the app which will be dependent on the library. Do not forget to add ~Tests suffix for your test folders and test files. LinuxMain.swift file must be under the Tests directory. Create a static variable inside test classes and use it as a parameter while calling testCase() method in LinuxMain.swift file. We’re ready to start writing tests. We’re using this static variable as a testCase parameter. This will run all tests inside the test file. So, when you add new test methods, do not forget to include them in the static variable return state. When you create new test classes, do not forget to add ~Tests suffix and add testCase method to LinuxMain.swift file with static variable parameter. I’ll not explain how to setup Docker. There are great guides which explain everything in steps. I assume you already have running Docker Machine. Here is the basic Dockerfile to run this API with using Docker. It means that you can deploy almost anywhere you want (if supports Docker). Let’s see what is going on this Dockerfile. We’re using ibmcom/swift-ubuntu:latest image as a base image. This will fulfill our needs while running. If there is no setup for Swift, it'll install required Linux packages to make it running. After that, we copy all of our current directory (all files) to under /app directory and making /app directory as our working directory. EXPOSE 8090 command exposes 8090 port for our app. So our app will be accessible via port number 8090. Then, we set our current user as a root user to run everything with root access. Finally, everything is ready and we can build and run our server API. RUN swift build runs the swift build command and it creates executable files. Last line of Dockerfile just executes this executable. NOTE: In here we’re using debug executable. If you want to use release configuration, you can change RUN command to swift build -c release. This will create executable for release configuration. Then, you can use command .build/release/SwiftBackendApp in the last line. Here we go. Finally, we have working Swift Server API. I tried to explain all steps I did. I spent a lot of time to make this app testable. 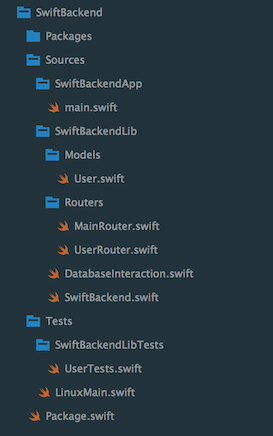 I didn’t know that folder structure and naming really matters for running tests with Swift. If you had some troubles that I didn’t mention here, please add them as comments. If you liked it, please click little ❤️ below to recommend it to your friends. If you want to be updated about new blog posts, you can go to my personal website and subscribe to my mail list. You can follow me on Twitter and GitHub. iOS/Software Developer. Curious. Writes about tech & science. Editor @theswiftpostco.